Take bus no. 554, which is available 24 hours a day and departs every 30 minutes. Route: Suvarnabhumi Airport – Rangsit (Ramintra road); fares are THB 24 – 35. Bus no. 555 operates daily, with the first departure at 4:30 am and last departure at 1:30 am. Buses depart every 30 minutes (total of 15 buses/day). Route: Suvarnabhumi Airport – Rangsit (Rama 9 expressway); fares are THB 24 – 35. *Note: Passengers must get off at Rangsit and take a to RMUTT. Taxi Meter: Distance from Suvarnabhumi Airport – RMUTT is approximately 50 km and the estimated taxi fare is THB 365 – 400. Yellow bus (Por or) no. 538 runs between the Priest Hospital, Victory Monument – RMUTT. The first bus departs from RMUTT – Victory Monument at 4:50 am (Monday – Friday) and at 5:20 am (holidays). The last bus departs from RMUTT – Victory Monument at 8:00 pm. Vans for the RMUTT – Victory Monument route take the Kanchanapisek expressway directly to RMUTT. Vans park across gate no. 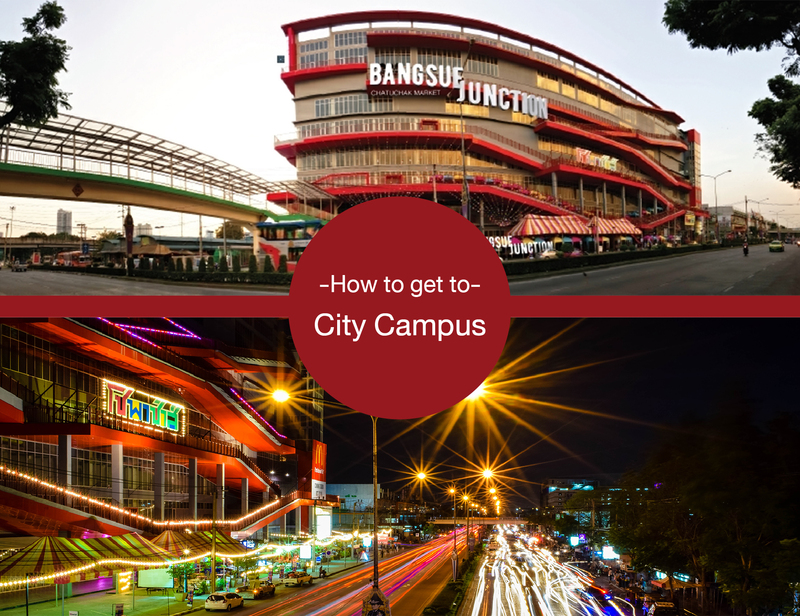 3 (Faculty of Education), Soi Porntisarn, and operate from 5:30 am – 8:00 pm. The fare is THB 50. Taxi Meter: Distance from Victory Monument – RMUTT is approximately 43 km and the estimated taxi fare is THB 350 – 380. 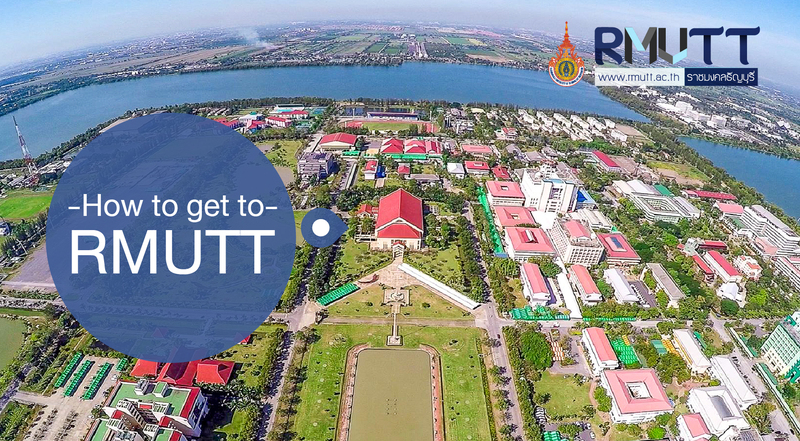 Distance from Don Mueang International Airport – RMUTT is approximately 23 km and the estimated taxi fare is THB 195 – 225. Yellow bus (Por or) no. 538, Take the bus from Future Park Rangsit, around the overpass that is across Future Park Rangsit. The bus fare is approximately THB 15. Green bus (Por or) no. 1156, overpass across Future Park Rangsit – RMUTT – (Khlong six). The bus fare is approximately THB 12. Buses are located under the overpass across Future Park Rangsit. Vans for the RMUTT – Rangsit route. Vans park across gate no. 3 (Faculty of Education) and the fare is THB 20. 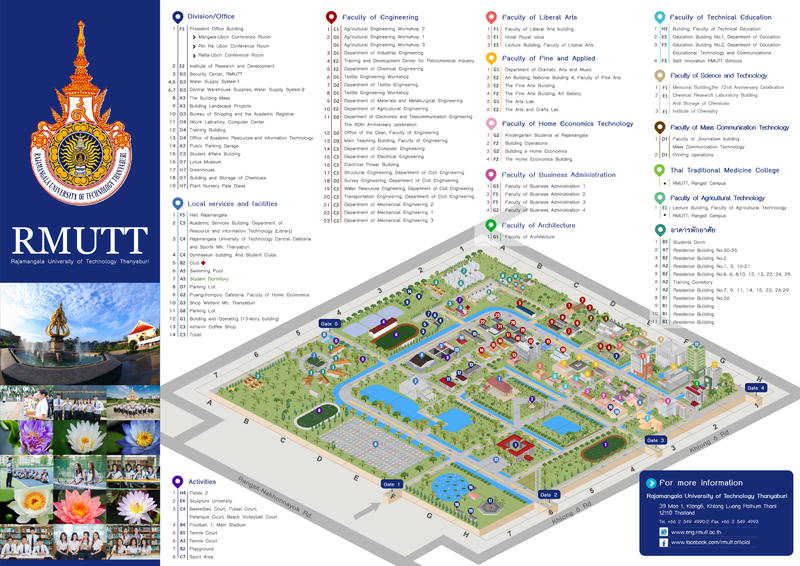 Buses from Rangsit – RMUTT are located under the overpass across Future Park Rangsit and operate from 5:15 am – 8:00 pm. 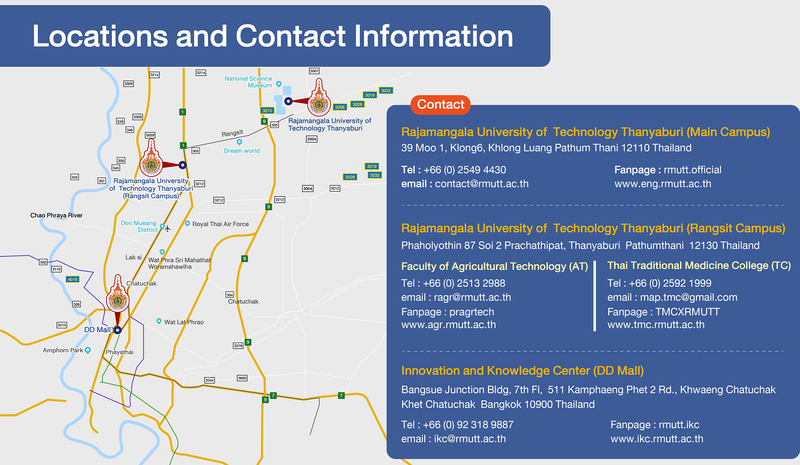 Taxi Meter: Distance from Future Park Rangsit – RMUTT is approximately 15 km and the estimated taxi fare is THB 120 – 135.